My sister and I spent a wonderful 3 days in the water with Don over Labor Day weekend 2018. It is our second year of fishing with him in a row. Don takes such good care of his clients and really goes out of his way to make sure that they have the perfect experience. He is a great teacher and he really knows his stuff! He is easy to spend a day (or 3) with. We love fishing with Don and will continue to come back as long as he will have us. My family of four - me, wife and two kids (ages 11 and 12) went out on a fresh water lake with Don. I can’t explain how patient Don was with the kids (and my wife and I). Sure, Don is an expert fisherman - I bet there are many of those around - but, I seriously doubt there are any as comfortable, happy and yes - patient - as Don. In short, our older son was having trouble catching a fish, while our younger son was catching huge fish and getting a ton of bites. My wife and I were also catching fish. My older son was following instructions for the most part, but just wasn’t getting any bites. Our trip time was up, but Don kept going to different spots and finally our older son caught a fish. Don was not annoyed - he was so good with us and the kids. And, yes - he is an expert that knows every turn and hole in the Maine area. I can’t recommend this experience enough. There are some things I look at when I go out with a guide. #1 Does he know his stuff, will he put you in a position to catch fish. I realize he can't get the fish to bite but is he switching things up and always looking for the spot that produces. #2 Local knowledge, does he share things other than fishing about the area you are fishing. Giving you a feeling of where you are at locally. #3 Is he fun...don't think I have to elaborate on this. Don is all of the above. He kept on working hard and trying new spots when the bite wasn't going on. Always had a sense of humor as he told stories of Maine. Boat was clean, gear was in great condition. His number is now in my phone for next time I go to Maine. Had a great time with Don fishing the Thomaston area. My boys had a blast. We all caught stripers. Great weather and great guide. Will definitely do it again when we’re in Maine. This was one of the highlights of our trip to Camden, Don was incredible! Extremely friendly with children and full of patience and good energy. He took us to a bunch of different spots and didn’t care to move if the fishing was not productive. He even took us to see an eagle’s nest so the children could admire it! I would recommend him as the best fishing guide in Camden!!!!! We had a great afternoon fishing for stripers on the beautiful St. George River! Captain Don was a great guide and host! We caught (and released) stripers in several different locations. We all really enjoyed the experience and we look forward to our next fishing expedition with Captain Don! 'We had fabulous time on our fishing trip! Don is very knowledgeable & will do everything in his power to ensure he puts you on fish! We caught lots of Striper & thoroughly enjoyed ourselves! Thank you Don! My brother-in-law and I spent an afternoon on the St. Georges with Don on Monday July 2 and I can't say enough about how enjoyable the experience was. The trip was made even better by our good fortune of a beautiful day with light breezes. While our day started out a bit slow with the fish somewhat uncooperative, Don worked it hard and we ultimately boated six stripers and had several other bumps and flashes. Don gave us just the right amount of coaching, and didn't hesitate to change up our bait or location if things seemed slow. He has a great knowledge of the waters and how and when to fish each spot. It was a pleasure fishing with him and I look forward to doing it again soon. Spent the morning of 6/21 with Don and my family fishing from his boat. I was nervous but with Don’s enthusiastic energy and patience we all had an amazing fun time!! Thank you Don! Loved the experience! We have been fishing with Don for a number of years and wouldn't miss a trip with him when we are in Maine. It is great hearing Don's stories and you never know what new technique or new lure you will learn to use. Many have come in handy for success on our own fishing trips. Today was an exceptional day and everyone caught a fish!!! Don was patient and helpful and made sure everyone on the boat was having a good time. Already thinking about our next fishing trip. Don was very knowledgeable and shared many interesting facts and we even saw a loon! Don K is a great guide an although I did not make it up to Maine this season, But in the past seasons of fly fishing with him have been rewarding. A.J. Don - Thanks for the great time on the water today! I am buying a boat and moving to ME! !…….not really. I will visit more often. I love it. Don walks the walk...worked hard to make sure he put me where the fish were and then it was up to me to turn fishing into catching....and I was able to end the day with a smile on my face and a promise to hook up with Don when I return to Maine. Don Kleiner is a wonderful guide. We had a wonderful day fly fishing with him today. Highly recommend a trip with him! Had a great day fishing with Don. He is always a pleasure to be with whether you are hunting or fishing. Thanks Don! Always enjoy a day on the lake catching fish with Don!!! Don: that was an absolute delight yesterday. We look forward to our next trip to St George! We had a beautiful morning on the St. George river, caught fish, and had a great experience with Don. Thanks! This was my third trip but the first for my friend of 44 years. We have both been fishing and hunting guides where we grew up and can't compare to Don. As usual the trip was as much fun talking and joking with Don as catching Large and Small mouth bass on the lake. When we got back to the landing our wives were there and he offered to take us all back out to see the Loon chicks that had just hatched out which was a real joy for us all. It was such a pleasure to enjoy a half day of striper fishing with Don! Catching fish is part of the experience and we caught lots, but the personality of the guide is even more important. Don get's a A+ on both accounts. Great time!! Don's jovial and patient guidance made for an excellent fishing trip. His advice and knowledge helped these novices catch several fish. It was a thoroughly pleasant day. Thanks for everything Don! One of the most enjoyable 3 days of fishing I have experienced. I have fished with guides in many parts of the U.S., including Alaska and Hawaii, and I think Don provided an experience as good, or better, than any other I have had over the last 20 years. The highest compliment I can give is that we booked again for next year as soon as this years trip was completed. Don convinced my 12 year old nephew to go for a ride on the boat and told he'd take him back if he got bored. 3 hours later my nephew had out fished me and had a great time! Thanks for the awesome afternoon and the excellent fishing. Hope to return next year. We've now gone on 3 fishing trips with Don. He is a wonderful teacher to my 6 and 4 year olds showing them how to fish but also the fun of it. He's also great with the adults. We'll be back next summer for more adventures. Thanks so much for the fishing experience and tour of Lake Megunticook. My wife and two boys and I had a fantastic time catching 30 fish between the four of us. Your great stories and personality were icing on the cake! Mr. Don, I can't express in words the appreciation I have for you and your memory making ability. My son Tanner has told everyone about the fantastic time he had catching and releasing all those perch. My hat is off to you Don for making a father's time with his a most memorable experience. My newly named husband and I went up to Maine for our honeymoon, and fell in love with the state. We had two days with Don that were absolutely spectacular. I have never met someone with so much joy and charisma--you can really tell that Don loves what he does. I felt like I was with a good friend or family uncle the entire time of our trip. Don made us so comfortable and catered to what we wanted to see, do and enjoy. We are planning to come back up next year, and will definitely come back for another guided tour. It made our Maine experience that much more wonderful! Thank you, Don!! My very first time fly fishing. We had a blast. Don was an excellent teacher. Provided everything we needed.... especially the fish. Kinda like if you have never flown first class, you don't know what you're missing.... Well now I have flown first class. Thanks so much for a great day! The kids truly had a blast and wanted to go again today. Thank you, Master Maine Guide Don, for the wonderful fishing adventure you provided for my granddaughter, Catherine. She enjoyed all the attention you gave her and really appreciated your showing her all the wildlife, She liked the red fox the best! My son and I both were pleased as to how good you got her to cast. Many, many thanks for this special Maine outing. I've been fishing with Don a few times but this time it was 3 generations. My father, myself and my daughter scheduled a trip.The smallmouth were biting and we had a blast. My daughter was the queen of the day. It was all about her and Don in his normal fashion made it all possible. He catered to her every need from food to the restroom. He had my 11-year old casting and retrieving like a pro. Who cared if the fish weren't biting?Don educated her all the wildlife, water and the sights. Don is great with all generations and we highly recommend him for you. Went fishing on the lake with my husband , my 7 yr old son and Don. He took care of my son and my husband and I were able to fish and enjoy the beauty of Maine while our son was fishing and having an awesome time as well. Don is such an awesome guide. Our next trip to Maine, will defiantly include booking another trip with Don!! Highly recommended. Thanks for the great fishing trip!! My boys and I went fishing on Lake Megunticook w/ Don. He is awesome and the morning we spent was perfect. Don is particularly patient with beginners and my boys loved him. What a great day! Thanks Don for an unforgettable experience. We will be back! Don was a real pro...lots of positive conversation and even more fish! The shore lunch and sights were fabulous. We recently went on a canoeing trip with Don. It was a reunion of sorts in that we had taken a trip with him nearly 18 years ago. He was as wonderful and enthusiastic as we had remembered. There were 8 in our party and we watched eagles and the beautiful Maine landscape on a peaceful morning. It was a great trip! We spent a day with Don and had a blast! We caught plenty of bass and enjoyed the experience Don had to share with my wife and myself. I think my wife's fly casting improved through Don's guidance and she caught the biggest bass of the day. Anyway, from start to finish, the day was tons of fun. Once again our fishing trip with Don was one of the highlights of our trip. He is the ultimate guide and a pleasure to be with. Our fishing time was over in a flash! See you the next time we're in town. friends. Hope to see you again next year. and experience of the area. This being our first visit to New England. Pond and the river learning about the various habitats and nature. My wife and I really enjoyed our boat ride / fishing trip with Don. I caught several bass and we both saw some great scenery. My wife doesn't fish, but was very glad she went out on the water with us. Don is a very entertaining person and knows the Megunticook like the back of his hand. If you are in the Camden area, or close to it, call Don for a memorable day on the water. A morning of fishing with Don for bass in Camden Maine just can't be beat. Don is professional, knowledgeable, and friendly- and was able to help my 70 year old mother catch the fish of the day! She is still talking about how much fun she had that morning. My two sons and I had the pleasure of finding Don on the Internet and what a great pleasure it was to spend the morning with him. The fish I think took the day off but the time I got to spend with my Sons was priceless. Don made our fishing trip an experience of a lifetime, we saw seals, three families of porpoises and got to know Don as a person and now consider him a good friend. We will definitely being seeing Don in the near future. Don was a wealth of local lore and we enjoyed every minute of our conversation. If you want a memorable boat ride then I would recommend visiting www.maineoutdoors.biz and make your own family memories. Had a great morning of fishing with Don on the St George river. He was right on time for an early start, and worked to put us in the best spots to catch fish. I am a relatively experience fly fisherman, and Don provided tips when needed while leaving me free to fish in the right spots. He was a real pleasure to share a morning with and we did some great sightseeing as well as fishing. Don picked up my two sons and myself at the B&B he suggested, the Inns at Blackberry Common in Camden, ME. He was spot on with this, we had a beautiful room and amazing breakfasts there! Don is one of the special people you meet whom has a love for what he does. He is an experienced guide and fisherman and represents the best of what the State of Maine has to offer. He made our trip so enjoyable from the great fishing techniques he showed my sons to gorgeous views and incredible fishing. I was most impressed with his patience he had with my 12 and 14 year old boys. They really didn't have much experience with freshwater fishing and his coaching insured they both caught a lot of fish and a great time! We will be back again! We want to thank you again for the great experience on the eagle watch on Wednesday. Linda and I had a wonderful time seeing all of the eagles and the babies. You were very knowledgeable and great at finding the eagles and other wildlife. It was so enjoyable that we will be doing it again. 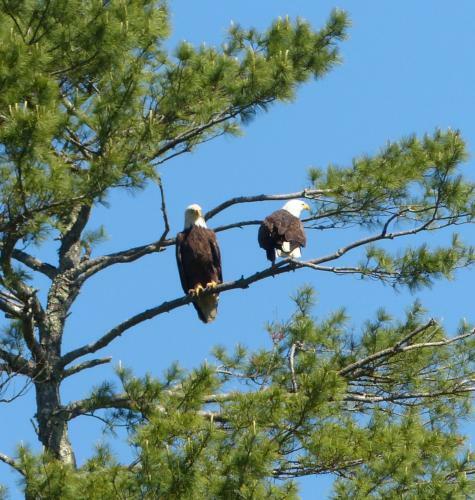 I have already referred an eagle lover friend to you to do your eagle watch tour. To get the most out of our 7 days in Camden we hired a Master Maine Guide called Don Kleiner (maineoutdoors.biz) and I cannot recommend this man highly enough as he gave us 2 days of absolute Maine perfection. We were picked up at Abigails by Don who greeted us as if we were old friends for our first trip which was a half days fishing on Megunticook lake. We had only just pushed away from shore when Don spotted an osprey which was an amazing start for us but it just got better and better with eagles, loons, woodpeckers and even deer but to name a few...plus we caught a fair few bass and pike. Its amazing how he sees something then tells you where to cast to and a fish is on...though it wouldn't have bothered us if we didn't catch as the sound of a woodpecker hammering away on an incredibly beautiful silent lake was worth the trip alone. Of all the guides I have had on trips in my life, and there have been many, you are the best! Thank you again for such a wonderful paddling experience. It is one we won't soon forget and will most certainly turn us into regular paddlers once we get to Oregon. We hope you have a successful season. You are a most enjoyable guide. Sincerely, Ron & BarbDon, Thank you again for such a wonderful paddling experience. It is one we won't soon forget and will most certainly turn us into regular paddlers once we get to Oregon. We hope you have a successful season. You are a most enjoyable guide.